Part of the challenges set forth with the new 52 relaunch was how to tell the story of its most famous heroes. Parts of the heroes identities were so well known and so well established that it would be hard to put a modern spin on what is essentially comic book mythology by this point. Thus Batman’s history was no different as the hero was born on that night in Crime Alley, just as Superman hurtled to Earth in a spaceship from dying Krypton. In fact the origins of most of DC’s major heroes has not been changed at all save for one, the Flash. Some commonalities still remain, but many are different. In a way it makes sense, as Barry Allen had about twenty years of down time before he came back into mainstream continuity, and the lessons learned from the last days of the silver age taught that there were certain things important about the Flash’s history, but some that needed a touch-up. In particular is the end of the silver age, the somewhat confusing trial of Barry Allen that helped lead to his death in Crisis on Infinite Earths. The importance of Eobad Thawne to Barry Allen is a relationship that needed to be maintained though, as important to Barry as the Joker is to Batman or Lex Luthor is to Superman. Although other villains have more visibility, it is Thawne who is the true arch-nemesis of Barry, plaguing him throughout his existence in one way or another. As a modern and updated telling of Barry’s nemesis, this is the story that demanded to be told in the new 52, and it is the one which is being told now. It should be said that the Flash is often one of the heroes that tends to be a bit below the surface in terms of popularity, and it can be easy to see why. The nature of his stories are a bit more lighthearted than some others, but when it comes to Thawne it doesn’t matter. Drama must prevail. The story of Thawne is one that has been teased at for a while now, but one that is still in its infancy in this story arc. Barry has to deal with his father, has to be there for Wally, and shows signs of reigniting the traditional relationship with Iris, but this is all about the setup for the showdown with Thawne. In so doing this issue shows that the story line is still in its early stages, with Thawne’s group of villains playing a larger role here than Thawne himself. What is supposed to be a big story is therefore somewhat diluted by the slower rollout as well as not really changing much from the regular script of this series. It is fun and does well for the hero, but the the dramatic payoff still seems to be far enough away as Barry deals with the mundane (mundane for a superhero that is) before the bigger fireworks start. This issue will probably become necessary reading after we see whatever finale is ahead for hero and villain, but for now stays true to the performance of the series, good but not great, with a decent amount of fun. 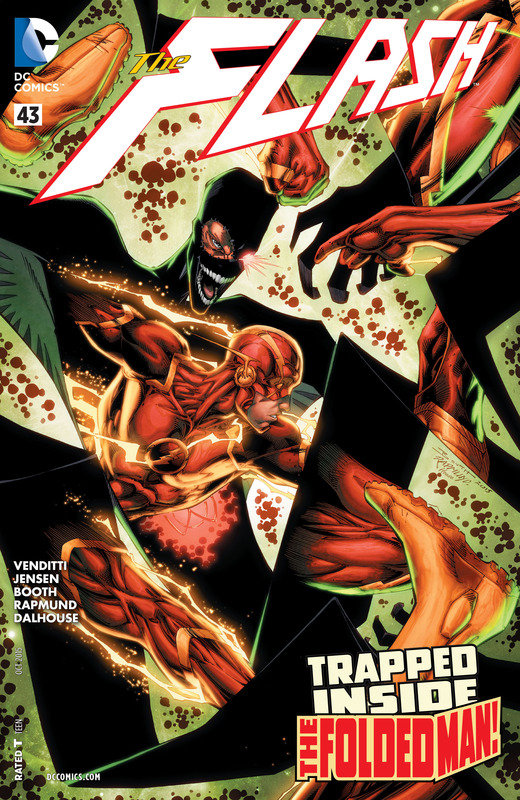 DC Comics Announces Tons of Additions to Arrow, Flash, & More! With the fall television season quickly approaching, there’s tons of news coming out for this coming seasons of Arrow, The Flash and more! Bummed that Constantine was cancelled? Well, the character is back from the dead. Matt Ryan will be guest starring as John Constantine on an episode of Arrow in this upcoming season. There was an effort to get the show moved to The CW when the series was renewed by NBC. Could this be a test to see more of Ryan’s fan favorite Constantine? Wally West is coming to The Flash! Warner Bros. and The CW have cast Keiynan Lonsdale as West. In comics, the character is also known as Kid Flash! With Iris and Joe West it’s not a surprise the character would eventually show up, but his role, or if he becomes Kid Flash, remain a mystery. Lonsdale is a series regular, so chances are good we’ll see exactly that! We know DC’s Legends of Tomorrow‘s villain is Vandal Savage, but who is bringing the classic character to life? We won’t have to wait for the team to assemble in 2016 to find out. It has been announced that Casper Crump has been cast in the role. First introduced in 1944, Vandal Savage has been one of the DC Universe’s biggest heavies for over 70 years, frequently going up against the Justice Society and most recently fighting alongside Etrigan the Demon and Madame Xanadu in The New 52’s Demon Knights. However, he’s never been brought to live action life before (though he’s appeared in animated movies and shows, including Justice League: Doom and Young Justice). Crump will first be seen in the role in the crossover episodes of Arrow and The Flash, before continuing onto DC’s Legends of Tomorrow. We know Hawkgirl is part of DC’s Legend of Tomorrow, but we now have a Hawkman too! Falk Hentschel will be taking on the role of Carter Hall. The character will first appear in crossover episodes of Arrow and The Flash. While her older sister Lois may still be hunting down stories in Metropolis, it appears that Lucy Lane is heading for National City. It has been revealed that Jenna Dewan-Tatum has been cast in the recurring role of the younger Ms. Lane on CBS’s upcoming Supergirl. Described as brash, funny and as beautiful as her older sister Lois Lane, Lucy is strong, smart and successful in her own right. She’s got a history with Jimmy Olsen and she’s come to town to right a previous wrong. She’ll first appear in the third episode of the show. While not as well known as her sister, Lucy Lane was first introduced back in the Silver Age, where she worked as both a flight attendant and an air traffic coordinator. She also initially served as a sometimes love interest for Jimmy Olsen, so her “history” on the show with Brooks’ Olsen isn’t all that surprising. However, she’s probably best known to DC Comics fans as the most recent iteration of Superwoman. In pre-New 52 storylines, Lucy obtained powers similar to a Kryptonian by wearing a mysterious suit. Whether we’ll ever see this take place on Supergirl, however, remains to be seen. The character has previously shown up on Superman: The Animated Series, Lois & Clark: The New Adventures of Superman and Smallville. This past week featured what might be a first in the history of superhero comics. On two separate covers from the same publisher, a supervillain appeared posited to eat a superhero. 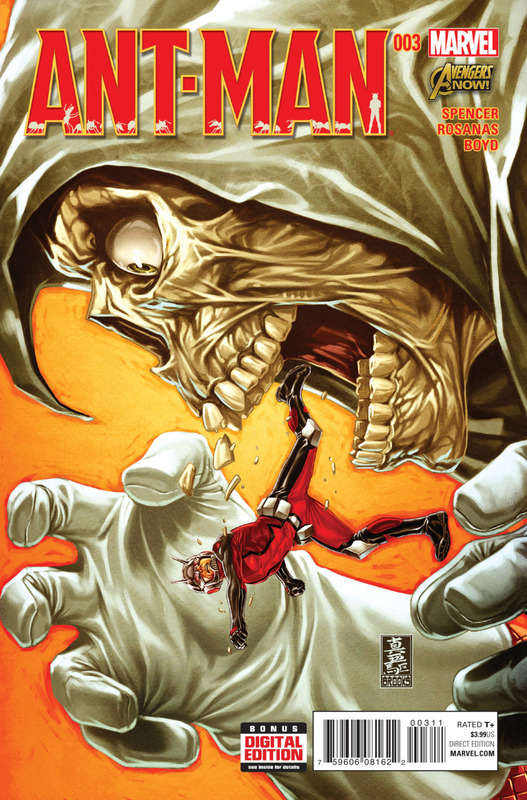 On the cover of Ant-Man #3, Taskmaster is seen trying to do away with Scott Lang simply by eating him, a solution that not many consider when facing off against the diminutive hero. 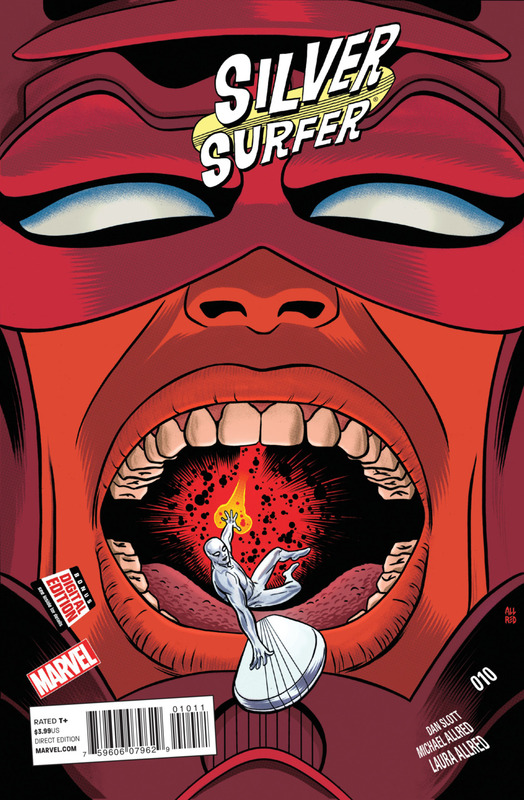 On the cover of Silver Surfer #10, Galactus is seen to be in the process of eating the Silver Surfer, though he is shown to be putting up more of a fight than Ant-Man. While this is a bit of an oddity, it is with good reason that it stands as an oddity. Heroes generally have pretty amazing powers, either the godlike heroes from DC or the generally more down-to-earth heroes from Marvel, but among these amazing powers the powers of super-eating rarely come up. My knowledge of Marvel is not as strong as with DC, but even at DC I can think of only two semi-prominent characters that can eat as a power. In the 1980s and early 1990s, Chunk acted as a villain and later as a friend to the Wally West Flash. Though evidently a dedicated eater based on his physique, his power was not strictly super eating, rather he could open a pocket dimension through his mouth. Another character is Matter Eater Lad, who can bite through and consume anything, even if it should otherwise be fatal to him. On a grander scale at Marvel, Galactus can be considered to be an eater of sorts, even if the eating is more figurative than literal, and this his inclusion in this strange comic trend is not surprising. Regardless of how often a supervillain decides to bite into a hero, it is something which is rarely seen on a cover, even going so far in both of these cases to seem to be a complete consumption of the heroes. The incidence of this on two covers in one week from the same company is certainly an anomaly but also highlight the strange place of eating in the realm of superpowers. Fear of a Black Kid Flash. Not so Much a Female One. Although they are based off of general consensus and are generally pretty silly, the so-called rules of the internet cover this topic to a degree, specifically rule 63 which states that for every male character that a female version of this character also exists. While not absolutely true, it is often the case at least with the most popular characters. Some are direct rip-offs, though very rarely does a character assume the actual identity of the character, though the new female Thor is potentially going to change this. The female characters generally are presented in one of two ways. Either they are a female character that is modified into the costume of a male hero, as in the case of Stephanie Brown in the costume of Robin or May Parker in Spider-Man’s costume, or with separate characters in obviously feminine costumes as in the case with Supergirl and Batgirl. In these cases though the character is separate and not taking over for the main role. While this in itself could be interpreted as a statement of gender, it is still worth noting that each character has their own self and their own past. This being the case it would seem that the problem with the case of Wally West is not that directly of skin colour but that of identity. 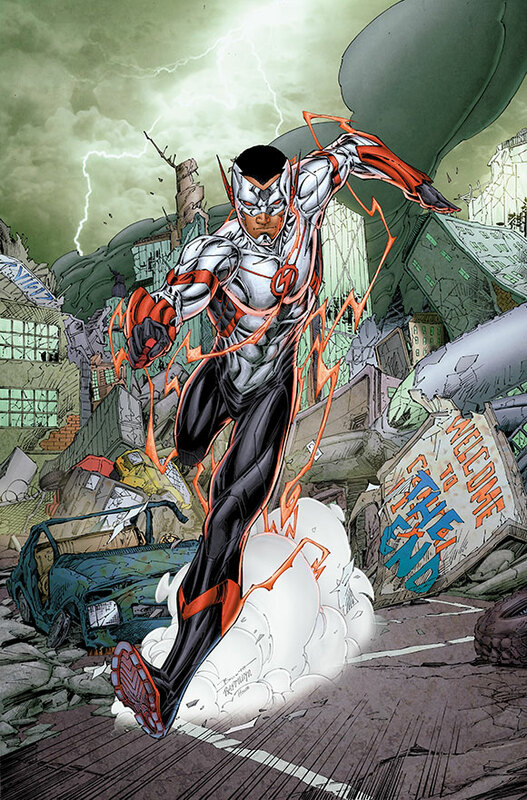 Wally West was an established character for many, and to change something as deep as skin color for many readers meant a fundamental change for the readers. Is this fair though? If indeed the female character had been named either Wallis or Walda (I know these are more obscure names) would that have been so easily forgiven? There exists a lot of other names in comics to distinguish one version from another. 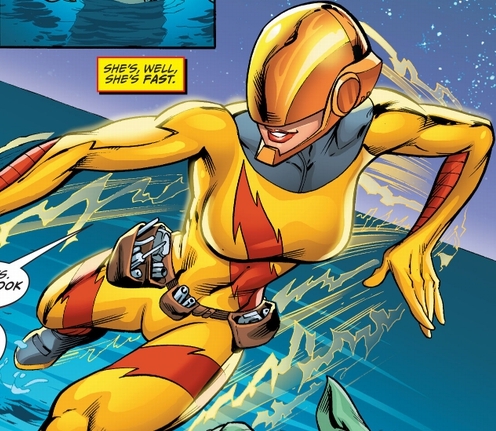 One major example is the previously mentioned example of –girl which is used almost exclusively for female versions of male characters (with the exception of the Legion of Super Heroes characters as well as Wonder Girl), but in terms of the Flash there was already a descriptor for this difference – “Kid”. As the character gained more depth though, he was no longer associated with his own name and instead that of another, Wally. He became a real hero in the way that real heroes do, that by association by their non-hero names is almost as evident as with their superhero names. In this way it is not possible to have a character named Batman that is not Bruce or a Superman that is not Clark. The question is though, is whether skin color and gender are so tied to those identities. It would seem as though the answer in both cases is yes, except the more so for skin color. Not all fans, but some fans are willing to make fewer exceptions for a black version of a character than for a female version, and perhaps some of this is tied to identity but some is not. A distinguishing factor here is the previously mentioned aspect of power. Even Supergirl, who is as much Kryptonian as Superman, is never said to be able to match him in power, despite their powers having nothing to do with their specific gender physiology. Equally Stephanie Brown, for the short time that she took over as Robin was never seen as his equal, even being regarded by Batman as an unnecessary risk to be allowed to act in the role. It is thus the case that female characters rarely break the gender role/stereotype of the female gender, but it is not the case with a black character. Black versions of the white characters are usually just as strong and able at superheroics, and this is likely also part of the outrage over the characters. That in some ways the girls will never compete truly for the title, but that the black men can, and this is the true danger with a black version of a favorite character. A black character makes the original white character replaceable, while a female character only makes a lesser powerful version of that main character. In the first case fans will often reject the change, but in the second case it is more acceptable. In light of all the commentary about the medium in recent months, be it over the black Wally West or over the comments about the new direction for Wonder Woman, it is important to note that certain aspects of the medium and their fans are still stuck with some outdated thinking.